If you love junk food then a detox diet is probably the cruellest eating plan you will ever experience. Even for relatively healthy eaters a strict detox can be a struggle, but happily not all detox diets are created equal. While it’s true that extreme detox probably won’t suit you, it’s possible to follow a more flexible and enjoyable plan while sticking to the main principles of detox. We’ll show you how to detox the junk food way! At the supermarket make organic, fresh and whole foods the mainstay of your detox shopping list, with plenty of fresh fruit and vegetables. Dump sugar in favour of honey, and swap bread for spelt or rye bread. Caffeine, alcohol and sugary drinks are out, so make sure you have access to a smoothie maker or blender to help create your own delicious drinks. Pizza fans need not feel deprived on a detox diet. You’ll need to adapt your ingredients, particularly the pizza base, so use the spelt or rye bread you bought for this purpose. 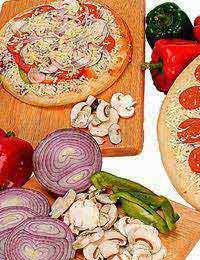 You can easily create a tasty range of toppings using fresh vegetables, herbs and homemade tomato sauce. Many detox diets allow cheese made from sheep and goat’s milk, so try crumbling some goat cheese onto your pizza. With a little inspiration you can easily knock up a detox meal that the whole family will enjoy. You’ll need to forgo the white bun, but making a detox diet burger is not difficult. Red meat is off the menu during your detox, but many allow chicken. Organic, free range chicken mince will make a delicious burger, simply add onion, seasoning and (non-wheat) bread crumbs. Serve with salad and perhaps some homemade tomato ketchup. Who needs shop bought, fat-packed burgers when it’s this easy to rustle up your own? If your trips to the burger restaurant aren’t complete without a milkshake, you’ll love whizzing up your own smoothies. With a blender or smoothie maker this couldn’t be easier – simply gather your favourite fruits and some flaxseed or oat meal (for extra fibre) and blend. You’ll soon work out which combinations work best, and honey can be included for extra sweetness. For those of you with a sweet tooth, sugar isn’t your only option where desserts are concerned. Try fruit with live natural yoghurt and a drizzle of honey – add chopped nuts and raisins for extra texture. Popcorn is so easy to make and can form the basis of a quick and tasty dessert or snack. Add a little sea salt if you like yours savoury, or stick with honey for a sweet, sticky treat. It is possible for junk food addicts to survive and even enjoy a detox diet plan - the important thing to remember is to stick to fresh, nutrient packed foods. Traditional burgers, pizzas and puddings are usually laden with fat, sugar, and other toxins; whereas homemade versions will be healthier, look more appetising, and keep you full for longer. Give a detox a try!